Finally, finally time to tick off a distant and durable destination, the heralded Halfway Cafe at Darsham. Couple of occasions we've come close, either shooting past to the Hamper or being seduced en route by Louie Lou's. Today, though, a decision has been made. All hail the Halfway! See where this is going? So we park outside, next to the railway line which crosses the A12, and head inside. There's no obvious signage, oddly. Are we in the right place for the cafe, I ask? Yes and no, says the lady running this emporium of bricolage. That disappeared back in February. Oh. Try the caff in the garage over the road. They do a good sandwich. It's the Bubble Tea Lounge all over again! 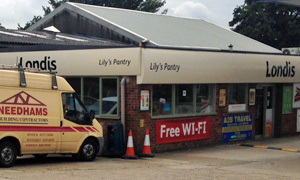 Two hundred yards up the road sits the Darsham Service Station, home to the unprepossessing (visions of Boss Hoggs) Lily's Pantry. Easy to park, free WiFi. Where's the actual cafe? Inside the Londis shop, size of a small Tesco, sits a Greggs-style "Good To Go" hot counter with sausage rolls, cheesy pastries, etc. If none of those rallies your calories, choose from the single page laminated menu for jackets, ham/egg/chips, etc, all freshly prepared. True to form, bacon bap for our Andy and some beans on toast for YT. Yes, they can throw in a fried egg for an additional 50p, bless 'em. Take a seat. One big plus point is the fantastic range of soft drinks in the fridge. Us being posh birds, we both choose cans of San Pellegrino, darling. Truth be told, the seating area is capacious and even has a sofa or two but seems a little unloved. I'm reminded of a French "aire" (shop sells baguettes) prior to extensive refurbishment. Anyway, here's our piping hot food and this'll more than do, and is most likely not far off what we might have had at the Halfway. Gotta love some egg and beans. Vintage b&w Jaguar and Maserati racing car prints prettify the walls. Don't speed, kids. It's neither big nor clever, especially on this particular stretch of road. Being Friday, there's all the time in the world for pudd, but what to choose? We've become conditioned to expect a fine array of cakes. These bags of cookies and muffins on display aren't fulfilling expectations. Thank goodness for Mr Kipling's reliable cherry bakewells along with a none-too-shabby push-button latte. So, Lily's. Nowhere near as bad as you might expect. If it was a car -- Vauxhall Frontera. If they were passing by -- Lily Loveless.